My Back 40 (Feet): There wasn't any snow in the back 40. There wasn't any snow in the back 40. 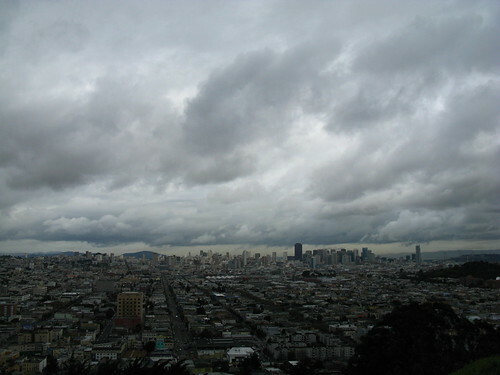 I noticed the state and national media picked up, in a small way, on the story of San Francisco's recent weather. We were told to possibly expect snow at sea level, which has not happened here since 1976. Well, in case you were wondering, it did not happen where I am although there were some reports of light snow at some of San Francisco's higher elevations. There has, however, been lots of storminess and drama in our skies. I took this picture Thursday morning during one of my currently very rare study breaks in which I leave the house. It started to rain shortly afterwards. Fortunately, this quarter is almost over and before spring quarter begins, I will be taking a week-long road trip up the coast, all the way to Seattle. I should come back with lots of bloggy bits as I will be stopping to see the sights in many places. No snow here in Marysville either, although we've had some more recently than 1976. We did get a ton of rain, which I could really have done without. Yes, I've been hearing all week that SF was getting snow. Your weather guys sound like ours. It is when they don't predict it that you'll get it. Good to hear that your weather wasn't too surly. Travel safe! BTW-LOVE the new avatar/Bio pic! Have a good trip, it sounds as though you have earned it. No snow in the East Bay. In fact there was snow a week ago or so in the hills and all over Mt. Diablo, but this last storm just brought rain. I was pretty excited about a little snowfall. I should know better than to trust a weather forecast. That's a really nice pic of that storm. wow! We have a tonne of snow here. Too much. I am ready for summer! Yay for your road trip...let me know if you need a list of sites to see in Portland.